Razer had a presence at the recent BlizzCon show in California. The gaming lifestyle firm timed a couple of new gaming peripheral launches to tie in with the plethora of eSports activities and gaming announcements at the annual event. A new gaming mouse and gaming keypad were launched by Razer, said to be ideal for players of MOBA and MMO games such as the Heroes of the Storm and Warcraft series. In addition to the interchangeable functionality, the base spec of the Naga has been improved to offer a “5G, true 16,000 dots-per-inch (DPI) optical sensor with 450 IPS for faster and more accurate mouse movements,” 1000Hz Ultrapolling / 1ms response time, 7 ft braided fibre USB cable, and Zero-acoustic Ultraslick mouse feet. Users can configure all the buttons, mouse behaviour and Chroma RGB lighting using Razer Synapse 3 (Beta). The Razer Naga Trinity will become available in Q4 this year priced at U.S. $99.99 / EU €119.99. This is an ergonomic gaming keypad which has 32 fully programmable keys (seven more keys than its predecessor). It features Razer’s Mecha-Membrane key technology that offers “both a soft, cushioned touch and a crisp, tactile click with each keystroke”. Alongside the keypad resides a programmable 8-way directional thumbpad & scrollwheel. A hypershift mode expands the commands available to users by combining the directional and scroll wheel as modifiers for the keys. Razer suggests these commands could be used for shortcuts in Windows, macros and more. Other specs include; full anti-ghosting keys, unlimited macro lengths, unlimited game profiles, 1000Hz Ultrapolling, an ergonomic palm rest, a 7ft braided USB cable, approx sise is 203 x 153 x 60mm, 348g. 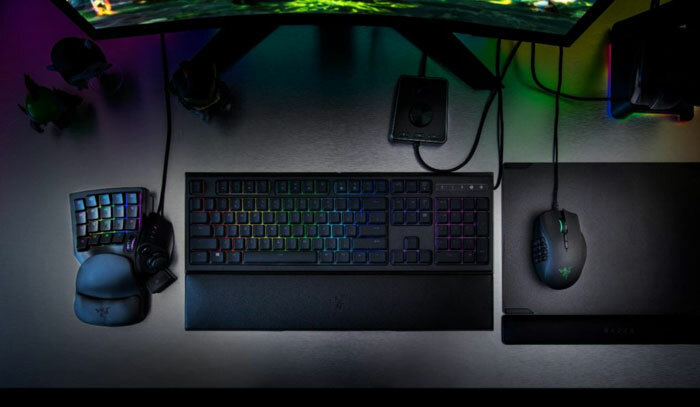 As you can see in the video above the Tartarus V2 is a Razer Chroma RGB LED system device. The Razer Tartatus will become available in Q4 this year. It will be priced at U.S. $79.99 / EU €89.99. The Razer Tartarus V2 is basically the Razer Tartarus, which is basically the Razer Nostromo, which is basically the Belkin Razer Nostromo N52, which is basically the Belkin N52….. really not much has changed since those days. I actually have a Nostromo myself and a friend has the Tart V1. I can't remember when either of us last used them, but they really only worked when sat on a sofa and gaming on a laptop/NetBook.